More About This Title Being the Best You! 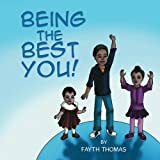 In a book that tackles a complex issue that faces children today, Fayth Thomas deliberates diabetes in a way that children can understand. Years ago, it was rare to hear about a child with type 2 diabetes. Now, according to the CDC, more than 208,000 people younger than 20 have this disease. With real-life examples told by children, the book inspires readers to do their part to combat this disease.